Two aboriginal mothers missing from the Kitigan Zibi reserve in western Quebec have been found safe in a rural area northwest of the reserve. Nicole Hannah Whiteduck, 31, and Laura Spence, 32, had been last seen on the reserve in Maniwaki, Que., about 130 kilometres north of Ottawa, on Sunday morning. Kitigan Zibi First Nation Chief Gilbert Whiteduck said the women approached a forestry worker in the area of Lac-Pythonga, Que., about an hour's drive northwest of the reserve. They identifed themselves as the missing mothers. Whiteduck said it was a "tremendous relief" to find the women and there were "hugs all around." "[It's great] how the community pulled together in the different resources as quickly as we can," Whiteduck said, talking about the work done to find the women. "It is doable and and it's something that if it ever occurs again we need to act and react very quickly." Whiteduck said the women might have been lost because there are many back roads in the area. The pair had gone out the night before their disappearance, according to Spence’s mother, Bridget Tolley. She also said they left their money, wallets and cellphones at home. 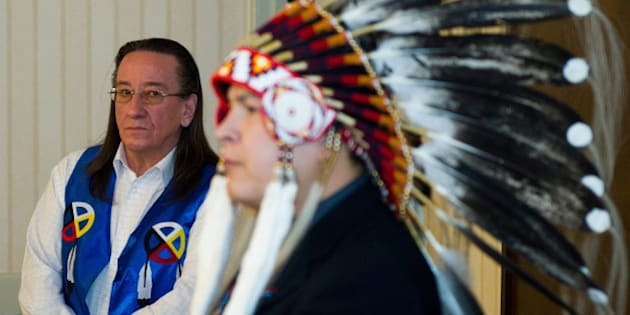 Their disappearance came about a week after James Anaya, the UN special rapporteur on the rights of indigenous people, called on the federal government to launch a "comprehensive and nationwide" inquiry into the case of missing and murdered aboriginal women. This summer, Canada's provinces also issued a joint call for a full inquiry. The federal NDP and Liberals have also requested this, but the government has yet to agree. The Native Women's Association of Canada estimates there are more than 600 missing and murdered First Nations women across the country. Two aboriginal women — Shannon Alexander and Maisy Odjick — disappeared from Maniwaki more than five years ago. They have not been heard from since. Quebec provincial police officers in Montreal say the investigation into their disappearance remains open.